Several school districts in the mid-state are using a tool that screens school-issued emails with the hopes of ensuring safety among students. 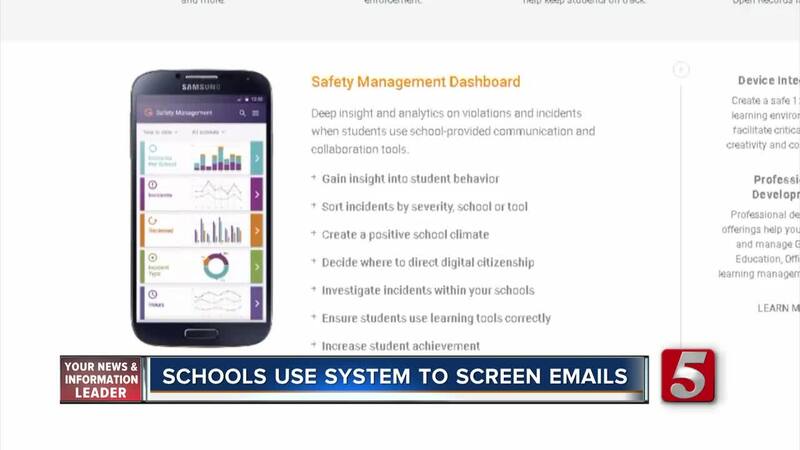 LEBANON, Tenn. (WTVF) — Several school districts in the mid-state are using a tool that screens school-issued emails with the hopes of ensuring safety among students. Schools in Bedford, Warren, and Williamson Counties, and the Lebanon Special School District are implementing technology from the Illinois-based company Gaggle. Gaggle uses a special algorithm to read school-issued emails, even before they are sent, for specific words and language. The system can intercept even before the recipient gets the email. Depending on what the email says, Gaggle has the ability to alert a “safety team” working around the clock if there is a threat or issue that needs to be addressed. A member of the team would alert the school district to resolve what the potential problem might be. Gaggle Vice President of Sales Bill McCullough told NewsChannel 5 that the intent is to help prevent major issues from happening including crimes, school shootings and suicides. He added that it could also stop cyber bullying. McCullough reported that Gaggle helped prevent 542 children from committing suicide in the last school year and stopped 240 people from bringing a weapon to school. If the child uses a school-issued email to log into social media platforms like Snapchat and Facebook, any notification sent to the email is also reviewed by the system. NewsChannel 5 asked McCullough if this is a breach of privacy. He said he feels comfortable saying that it is not because Gaggle only screens emails that is assigned by the school and not personal accounts. Gaggle covers five million children in 1,400 school districts across the country. Other districts in Tennessee that use Gaggle are Alcoa City Schools, Anderson County Schools, Arlington Community Schools, Athens City Schools, Claiborne County Schools, Jackson County Schools, McMinn County Schools, McNairy County Schools, Oak Ridge City Schools, Rhea County Schools and Unicoi County Schools.